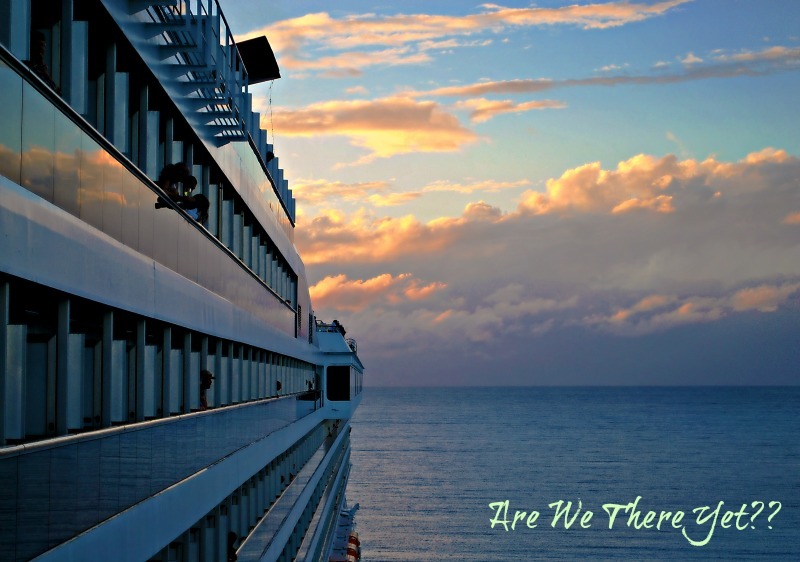 Are We There Yet?? : Things That Make You Go "Huh???" Things That Make You Go "Huh???" Several weeks ago Amanda and I went out for lunch on a Saturday afternoon - I can't quite remember where at this point but that's okay as the location doesn't really matter. 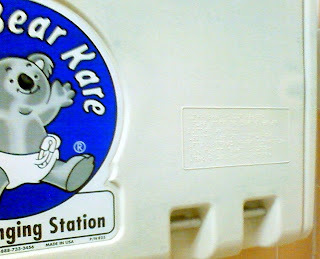 After eating I made a stop by the ladies room and as I was drying my hands I happened to look over at the familiar Koala Kare diaper changing station that I'm sure many of you have seen in various restrooms throughout the country. It was then that I saw something that made me say "Huh??" before I pulled my cell phone out to take a picture. 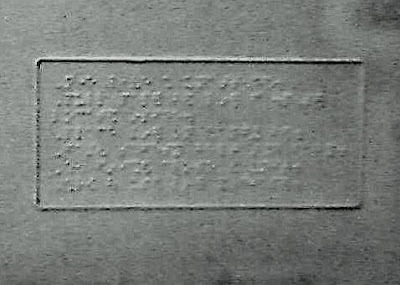 Due to the poor quality of my cell phone pictures, I had to edit the shot a little bit so that you could see what I'm talking about here but as you can not-so-plainly see - those are instructions in braille! I stood there for a moment trying to picture some poor visually-impaired woman coming into the ladies room, feeling around for the changing station, and then trying to read the instructions all the while balancing a crying baby or toddler who was in desperate need of a diaper change. I'm sure it's just another reason that I am going to someday burn in hell but the whole thing struck me as rather funny and I just couldn't for the life of me figure out the logistics of why?? I'm not at all adverse to someone filling me in on this one if anyone knows why otherwise I may have to continue to say "Huh??" every time I see one of those changing stations. It's all geared by the fear of a liability lawsuit no doubt. Like the labels on your hair dryer warning you against using it in the shower and things like that. Remember how McDonald's got sued because a lady spilled hot coffee in her lap? Lawyers run the country, who have really learned to capitalize on dumb people! I'm with Barb...Legal must have told the restaurant management to post this. I can't imagine having to change a diaper of a crying baby if I were visually impaired. That would be an almost impossible task. And no, Duchess Linda, you're not going to burn in hell! Lawyers and frivolous lawsuits rule our country...in sooo many ways! Thanks for the laugh. You're right...it's something a sighted person can only do. I was thinking the same thing that Barb said while reading this post. Everyone is so sue crazy anymore. I can see why your were scratching your head over this one. Yup, definitely for CYA. LOL! It is a cost saving mechanism just like the ATM machines. It is less expensive to make all of these things exactly the same so that they are interchangeable no matter where they are installed. Just because you don't need braille doesn't mean that a similar service in a school for the blind wouldn't be in order. One order with the manufacturer all made exactly the same. Im with you on that Linda lol! When you see braille on guns and riffles that's when it wont be funny. Lord. You are not going to burn in hell. It's a conundrum. for those commentors who make snarky comments about blind mothers being able to change a diaper. don't talk about what you don't understand. Blind men and women have and care for babies all the time....they even use bathrooms OUTSIDE of schools for the blind. And since I had toread the damn instructions on how to open that stupid thing the first time I found it I would suppose that a person who can't SEE the handle would have a hard time knowing which end to pull down or up or over on to get the thing open. Somehow I don't think those instructions were ever put there to actually be used. Chocolate Cake in a Hurry! I Can Haz Cheeseburger - and Fries!